SANTA MONICA, CA--(Marketwired - Nov 12, 2013) - What's old is new again: The very first practicable photographic process, the Daguerreotype process, is being reimagined for the digital age. In use since the 1850s, Ambrotypes are also getting the digital treatment. Who's behind this collision of old styles and new technology? Mobile arts pioneer iPhoneArt.com (IPA). Mobile art, or iPhoneography, brings old and new ideas together. Smart phones and other handheld devices combined with easy-to-use software applications have transformed contemporary art forms in an important way, making them accessible to all. Mobile artists everywhere are creating and experimenting -- a new art form is being explored. This trend continues with the Kickstarter launch of iPhoneArt's new digital Daguerreotypes and Ambrotypes. What are Daguerreotypes and Ambrotypes? Printed directly onto mirrors or aluminum plates, IPA's new digital Daguerreotypes are embedded in specially coated mirrors. The reflective surface of the mirror creates an iridescent print with the look and feel of genuine 1800s Daguerreotype prints. 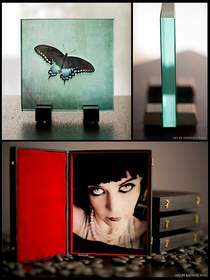 Ambrotypes refer to images printed directly onto glass blocks. IPA's digital Ambrotypes are printed on 3/4-inch polished edge glass and mounted on handmade walnut frames. The finished sculpture is translucent, allowing the light to shine through and add to the richness of the color. By creating new printing techniques that enhance the unique qualities of this new sub-genre of digital art, co-founder of iPhoneArt.com, Nathaniel Park, says he was looking to break away from traditional printing methods used in the fine art world. "We really want to draw on great traditions of the past and re-introduce them to the world with cutting-edge technology," Park noted. "There are a ton of apps out there that help artists create the feel of old analog processes and cameras. We take it one step further, and have developed outside-the-frame printing techniques that will render this retro aesthetic in contemporary physical forms. IPA is the only place that digital Daguerreotypes and Ambrotypes are available." Although there are many different ways to print images, printing the IPA way -- using distinctive materials and processes -- presents an artist's work in the highest possible quality, and preserves the piece for generations. Until now, these techniques have been available for high-tech commercial productions, as the equipment needed was too costly to produce individual prints. Through its printing arm, iPrints, IPA offers several different innovative printing processes, including printing directly onto aluminum plates, printing directly onto wood panels and mounting images onto thick bamboo blocks -- as well as traditional fine art papers and framing. While many of these options are available through specialty shops, only iPrints brings them all together, focusing on non-traditional materials and museum-quality production. Around since the 1850s, Daguerrotypes and Ambrotypes are now being re-imagined for the digital age -- by mobile art pioneer iPhoneArt. The company has initiated a Kickstarter campaign to showcase the new art forms, which are printed on mirrors, aluminum plates, or glass blocks. iPhoneArt.com co-founder Nate Park details how 19th-century photographic processes are being updated for the 21st century. He also discussed iPhoneArt's Kickstarter campaign, and how the global artist community is currently changing the world of art -- and ushering in the mobile age.